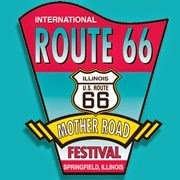 In just a week, the population of Springfield, Illinois, will temporarily increase significantly as thousands of people arrive for the 13th Annual International Route 66 Mother Road Festival. From Friday through Sunday, September 26 - 28, our capital city will be hopping with plenty of live entertainment on the Hot Rod Stage, the traditional Friday night car cruise (huge! ), plenty of vendors and food, and the Travel Illinois Expo. The Travel Illinois Expo (that's where my esteemed co-author Joe Sonderman and I come in) is presented by Illinois Route 66 Scenic Byway and will be set up on Washington Street between 5th and 6th Streets on the north side of the old capitol/old courthouse. For those of you that caught up with us there last year, we'll be set up in the same spot - at the corner of Washington and 5th Streets. We were at the center of lots of action last year! For starters, Joe parked his tropical turquoise 1957 Chevy Bel-Air right beside our tent for a little eye candy. Then, Abe Lincoln stopped by. (Abe always stops by when you're in Springfield.) Next, one of the other exhibitors in the expo brought in a group of super heroes! Talk about photo ops! 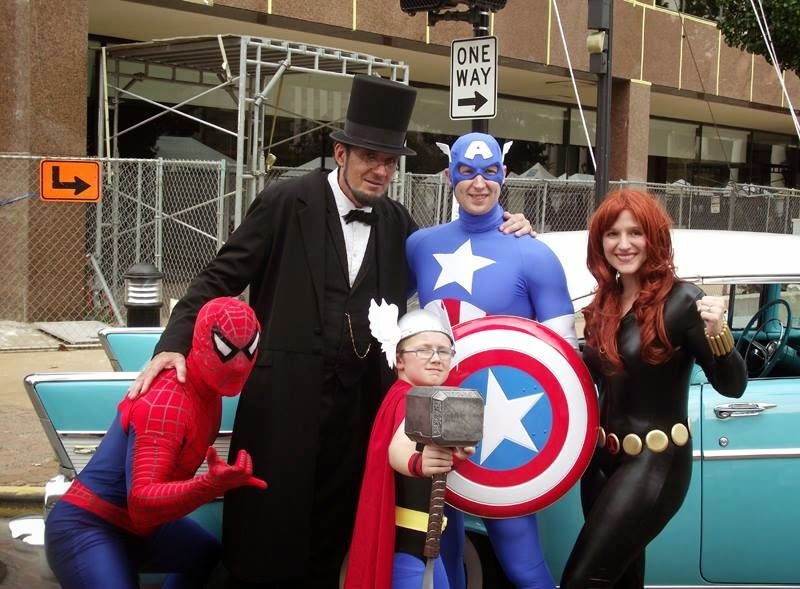 And the word on the street is that the super heroes will return to save the day, er, pose for photos, again this year! And I'm sure Mr. Lincoln will be hanging out at the festival as well. Here's what the action at our corner looked like last year. 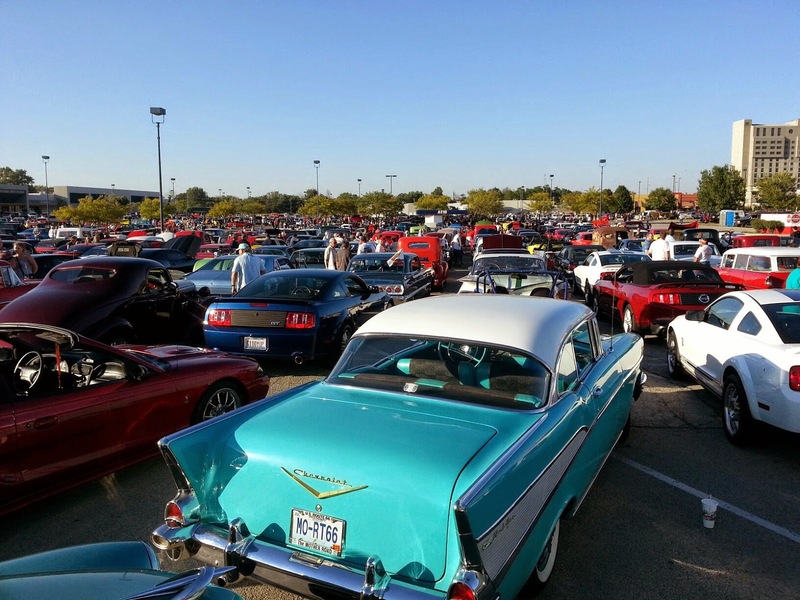 The car cruise was huge last year - over 2,000 cars, we were told. Everyone assembled at the Capitol City Shopping Center lot. Don't hold me to this, but I'm assuming it will start off from there again this year, cruising Stevenson Drive to Sixth Street to downtown. We were in a sea of vehicles last year, waiting for our turn to line up. We hope to see lots of Springfield and Illinois friends next weekend. We'll be there at the Expo all day Saturday during the day and then Sunday afternoon. If you're missing any Sonderman or Jett Route 66 books in your collection, that will be the time to get them and have them signed. We'll have a good stock of pretty much all titles with us, including the two new ones (both released in June), Route 66 in Illinois co-authored by both of us, and Joe's full-color postcard book, Postcards from Route 66: The Ultimate Collection from America's Main Street. 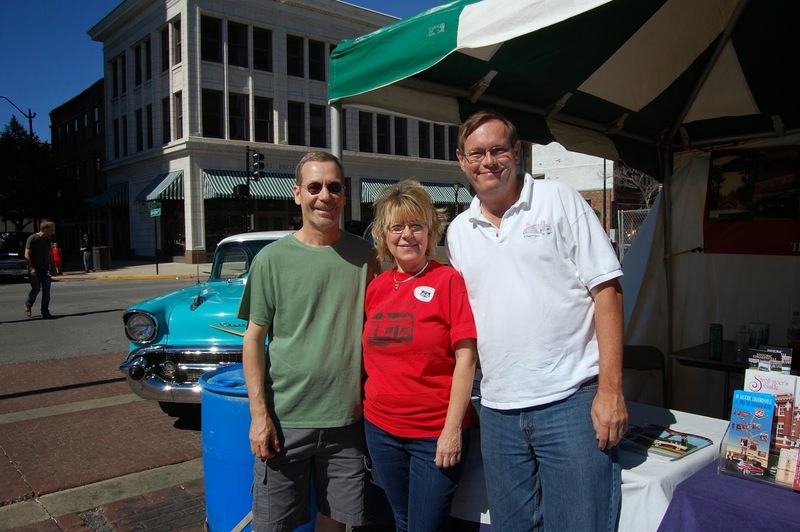 At our booth last year - L to R Springfield friend Randy Miller, me, Joe.